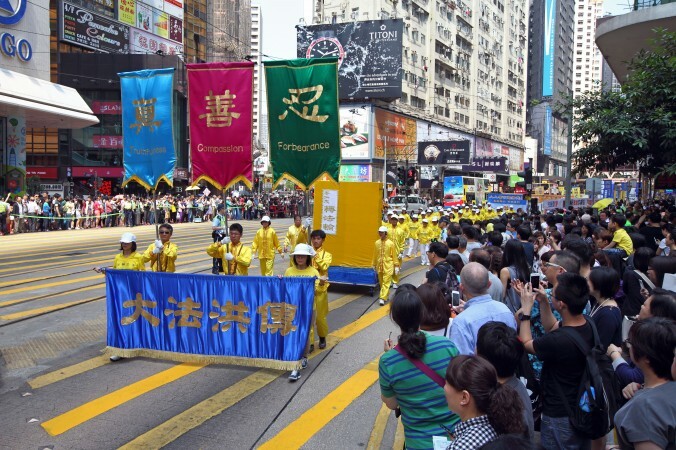 Falun Gong practitioners in Hong Kong and worldwide held marches and rallies this past weekend to mark the 16th anniversary of their peaceful petition at Zhongnanhai, the headquarters of the Chinese Communist Party (CCP) in Beijing. On April 25, 1999, over 10,000 practitioners of the traditional Chinese meditation discipline gathered at the Central Appeals Office near Zhongnanhai. They were attempting to defend their legal right to religious freedom and call for the release of Falun Gong practitioners who had been arrested for their faith. Their appeal was referred to as “the largest, most peaceful, and smoothest petition in China’s history.” However, motivated by jealousy and a fear of losing power, then-Party leader Jiang Zemin launched an unprecedentedly fierce suppression of Falun Gong. Practitioners of Falun Gong have been harassed, imprisoned, tortured, and subjected to forced organ harvesting for profit. These crimes against humanity continue to this day. On April 25 this year, practitioners organized massive commemorative ceremonies all over the world, including in New York, Ottawa, Melbourne, Sydney, and Taiwan. About 800 practitioners from Hong Kong, Taiwan, and neighboring regions gathered in Cheung Sha Wan that day. The event began with a performance by the Tianguo marching band. Hong Kong Falun Dafa Association spokesperson Kan Hung-Cheung said Falun Gong practitioners’ peaceful petition 16 years ago has won high international acclaim, and the CCP’s suppression of Falun Gong’s principles of truthfulness, compassion, and tolerance has instead brought down the CCP. Kan believes that the downfall of Jiang Zemin’s allies, including Zhou Yongkang and Bo Xilai, means it will not be long before Jiang himself is brought to justice for the persecution. Kan called on all mainland Chinese to quit and denounce the CCP as soon as possible. “At this critical moment in history, only those who can understand the truth and act from their conscience will be blessed and have a bright future,” Kan said. Theresa Chu, spokesperson of a Taiwan Falun Gong human rights lawyer group, expressed her views in a taped speech. Hong Kong legislator Leung Kwok-hung is convinced that all those who have suppressed Falun Gong and other citizens will be prosecuted. Veteran journalist Ching Cheong recalled hearing from his Beijing friends back then that Falun Gong practitioners’ peaceful April 25 petition was properly handled by then-Premier Zhu Rongji. Zhu was very friendly to the practitioners and did not adopt an oppressive attitude. “Jiang Zemin was very angry afterwards and criticized Zhu for lacking any awareness of class struggle, and he changed the Party’s stance toward Falun Gong since then,” Ching said. According to Ching, of the seven members of the CCP’s Politburo, Jiang was the only one who insisted on the suppression. The other six members were all against it. “Obviously Jiang was the sole decision maker. But once he had decided, it became the Party line,” Ching said. He said that the CCP’s suppression has led to great resistance. All these years, Falun Gong practitioners have persisted in exposing the persecution, including the crimes such as forced organ harvesting. Ching added that forced organ harvesting has received great international exposure, and China’s recent reaction appeared to be tacitly admitting its existence. He believes that as more and more people come to learn about Falun Gong, they will begin to show their sympathy and support. Ching expressed heartfelt respect for Falun Gong practitioners’ unrelenting efforts to oppose the persecution. He praised them for promoting the spirit of truthfulness, benevolence, and forbearance. As China becomes more and more materialistic, Ching believes that Falun Gong will have a crucial role in keeping up the righteousness of humankind. Translated by Stanley Ng. Written in English by Sally Appert.